The East Malling stream has attached much attention since my original post reporting on a mention in the parish magazine ‘In Touch’. Following this, Godfrey King detailed the route of the stream from its source in East Malling to the river Medway. The latest information comes via two emails from Diane Brazier. I have edited these to provide the information below. Diane is lucky enough to have the stream actually wind its way through her back garden! As a resident of East Malling 33 years Diane has seem much stream-related activity and an abundance of wildlife! When Diane first moved to East Malling from London in the early 1970s the stream was full of brown trout. The children used to drop lines with bait in the dip hole to catch them. Diane once saw a tiny water shrew doing water acrobatics in the dip hole. 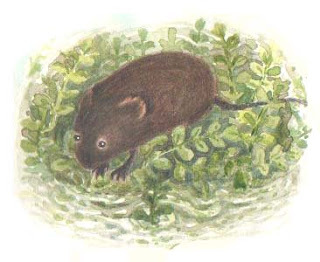 The stream has also attracted kingfishers, grey herons, moorhens, mallards, black caps and even water voles (please see the attached drawing carried out by Diane of a water vole on the cress beds). Diane also found two large crayfish whilst clearing out the stream. When the stream dried up last year they caught the last trout and ferried him upstream in a bucket together with as many of the tiny fish they could save. When the stream returned after the drought Diane once again saw the kingfisher in her garden. Diane’s late neighbour, Jack Watts, told her that in his childhood the stream was the village's main source of drinking water. If anyone has any drawings or photos of the old stream or the wildlife it has attracted I would be happy to post these on the site. If these are only in hard copy I'm happy to receive these by post (if you are happy to send them). Please email me and I will forward on my address.